UNITED NATIONS, November 1 -- While the head of UN Peacekeeping bragged Wednesday about the success of the UN Mission in Liberia, a complaint by UNMIL local staff of racial discrimination in high level promotion is pending, apparently unresolved. Dozens of staff members signed on to a two-page letter sent to the head of the UN's Department of Field Support, Jane Holl Lute on October 3. Inner City Press was provided with a copy -- now placed online here -- and then faxed a copy to the attention of Ms. Lute for comment. None has been received, just as no response was received to a printout of a complaint of gem trading by UN Congo staff which Inner City Press provided earlier this year to Ms. Lute. Combined with the no-bid $250 million contract given to U.S.-based Lockheed Martin for the upcoming Darfur mission, the questions surrounding UN Peacekeeping and Field Support continue to grow, barely responded to be the Departments. In their letter to Ms. Lute, the UNMIL staff complain of "racial imbalance that is being perpetrated by UNMIL Administration in this Mission.... the replacement of black top managers / section chiefs with whites... which in the end will ruin the very fabric for which the United Nations was formed." "the former CISS Henry Thompson (a black) was replaced by Melva Crouch (a white), thus paving the way for subsequent replacement of blacks by whites in the ISS sections. Former Chief of Transport (CTO) Mr. Justin Norris (a black) left the mission for almost eight months how and his deputy Crispin Bispham was been Officer in Charge and performing with diligence... why can't he be appointed to the position as CTO? Or is it that he is black therefore can not serve in that position?... Why can't Mr. Crabbe be appointed / preferred on a post he has been serving on for fourteen months now? Is it because of the color of his skin or what? We have just been informed that a white is coming to serve as Chief Engineer of UNMIL... UNMIL is a black mission in a black country; we expect to see nothing but racial balance when talking about top level managers and / or section chiefs... Urgently awaiting a redress." Four weeks after Ms. Lute received the letter, Inner City Press asked by fax for a comment on it and description of action taken. Inner City Press also asked about Ms. Lute's role in the sole source Lockheed Martin contract for UNAMID. No answer was received; Staff Union sources say nothing has been done. 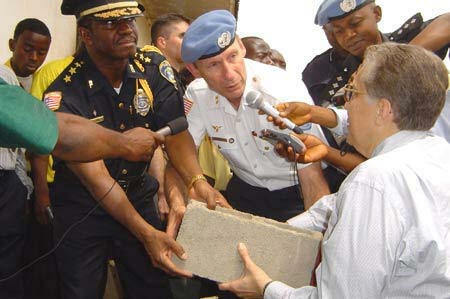 Reportedly, UNMIL's Director of Administration Stephen Lieberman has spoken of the "lack of qualifications" among Liberians, which should interest president Ellen Johnson-Sirleaf. There are other problems at UNMIL, beyond the abuse of local staff. A Pakistani battalion was shown to be charging $20 a night to those staying in its base. Inner City Press asked at a recent noon briefing, and was later given a canned statement by UNMIL. The questions multiply. Now Ellen Loj, former Danish Ambassador to the UN, is being sent to head the mission. Perhaps she can address these issue. We'll see.